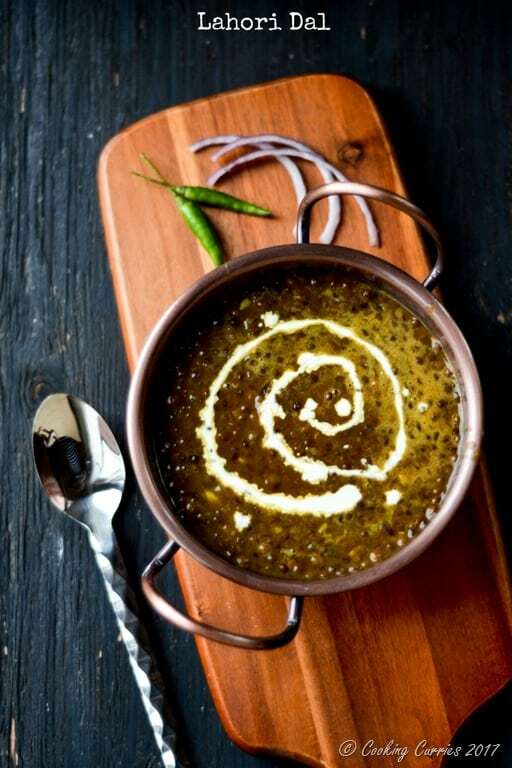 A simple to prepare dal, that is made extra delicious and special with the butter and cream in it. Any state or even city in India that you take, there will be a type of dal or lentil preparation that is very unique to them. 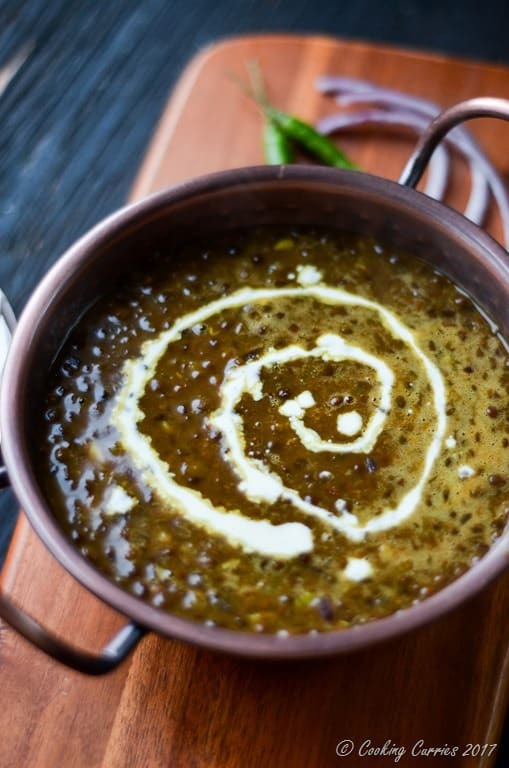 This Lahori dal recipe originates from the city of Lahore in Punjab, Pakistan. Punjab was split into two – one in India and one in Pakistan during the partition soon after India’s Independence. A lot of Lahori cuisine is influenced by the local Punjabi cuisine ( with it renowned Butter Chicken) and also by the Mughlai cuisine. This Lahori Dal is a very simple dal made with sabut masoor dal or whole brown lentils. These are the same lentils that become split red lentils or the regular masoor dal when skinned and split. 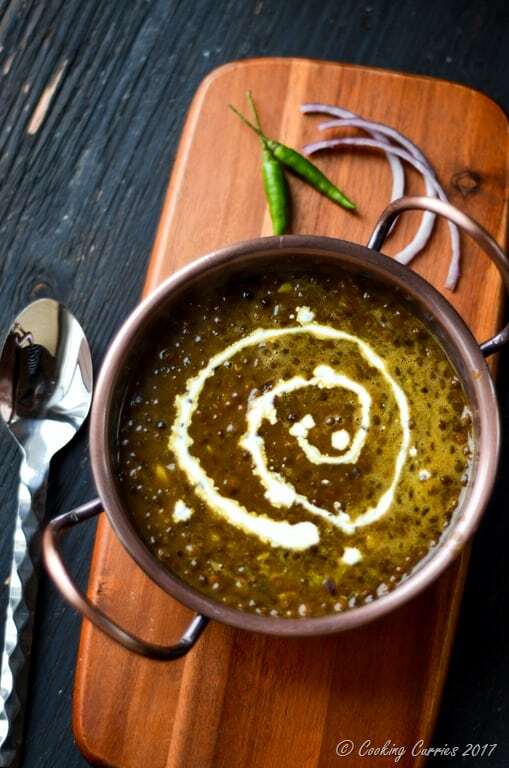 In spite of it being a whole lentil, it is easier to cook than other dals like chana dal and even toor dal. There is a significant amount of butter and cream in the original recipe of this Lahori Dal but I have used a lesser quantity as this is the recipe I use for everyday cooking. When cooking for special occasions or for guests, I amp up the butter and cream in this. Rinse the lentils with water. Pressure cook or cook on stove top with enough water – about 1 1/2 cups, until soft. Mash the dal till it is soft and almost all mashed up. Add the crushed garlic, red chilli powder, turmeric powder, thai green chilli and cream and mix well. Let it simmer till the dal thickens. Meanwhile, heat the butter in a small pan and add the cumin seeds. Once they start crackling, add the onions and garlic to it. Sauté till the onions become soft and translucent. Pour this mixture on to the dal and add enough salt. Switch off heat and squeeze half the lime over it. Drizzle the 2 tbsp cream over it as garnish once moved to a serving dish. It looks so beautiful and has a nice texture to it. We eat homemade lentil soup frequently, so I’m sure my hubby would love this. I am always up for anything with lentils – this looks so very deliciously rich and comforting. Loving all the wonderful spices. Thank you! I love lentils too! I love experimenting with Indian cuisine. The aroma of all those wonderful spices is so wonderful. This looks and sounds totally delicious. I make a lot of dal as well – various varieties but I haven’t given lahori dal a try yet. I will try it. You should! I am sure you will love this! ? This looks wonderful, I have all the ingredients so I think I’m going to make this on the weekend. Thanks for sharing. Oh yay! I’m sure you will love it. Let me know if you do make it ? I have never heard of dal before but I am up for trying anything new I have never had before. This looks delicious! Sounds delicious! I really appreciate the geographical explanation and context at the beginning of this post – I love knowing that sort of thing! I’m sure you get the whole masoor Dal in regular grocery stores. It’s whole brown lentils and the red lentils are skinned and split whole masoor. This is such a stunning Dal Manju. I love all the colors and textures. And since it is loaded with lentils. . .I like that I can sneak in a little extra protein into my day. This looks delicious. I am very lucky, my brother married a Punjabi woman so we get spoiled with delicious food all the time. I saved this recipe to try it out on my own. Thanks for sharing! Your Dahl looks delicious Manju. It’s one of my favourite lentil dishes but i’ve never tried it with brown lentils, I love the sound of adding butter and cream for a luxurious touch. The cream and butter takes it to a whole another level. You will love it! Thanks! 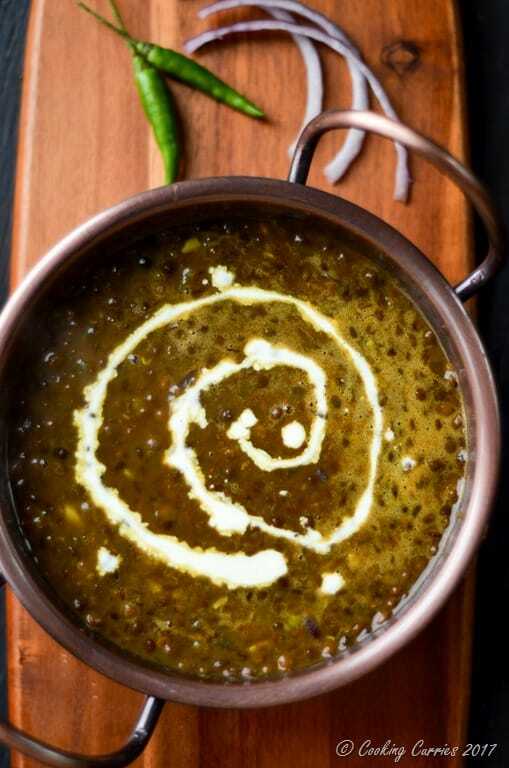 You should and something easy and milder like this Dal would be a good place to start. I love dal. This information about the differences in Lahori cuisine as a result of the partition! I can’t wait to try your recipe to the letter to taste its uniqueness and the enrichment from the butter and cream. Thanks for the culinary voyage. Thank you Lynn! Glad to have been of help ? This looks to die for! I can’t tell you how much Indian food I’ve consumed over the last year, its my absolute favorite. I haven’t gathered the courage to cook it at home yet, but I’ve got your blog bookmarked for when I get brave! ?if you need some extra courage, ping me on messenger and I can “live” guide you! I haven’t tried dal yet but I want to now. This sounds super good and very easy to make! I’m definitely pinning it! Thank you very much! That’s very good to hear ?